Preheat oven to 450º F. Toss shrimp with 1 tablespoon olive oil, salt and pepper. Place on grill at medium heat for 1 1/2 minutes per side. Remove from heat, set aside. Brush pears with remaining olive oil. Place on grill for 2 minutes on flat side. Remove from heat, set aside. Spread Alfredo sauce on pizza leaving 1/2" border around crust. 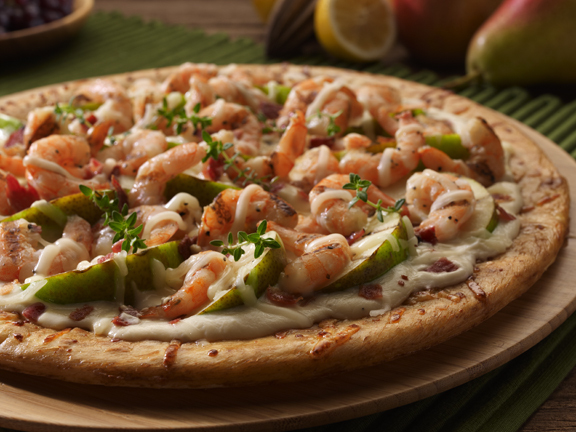 Top with cheese, shrimp, bacon and pears. Bake in oven 8 – 10 minutes. Slice and serve.